☆Motel Rive Du Lac is beside highway 20 exit 12, on the bank of famous lake St-Francois, located in the main street of St-Zotique, which is beside the city Salaberry-de-Valleyfield, 24 kilometres west of Montreal island, 42 kilometres to international airport P-E-Trudeau (Dorval) and 45 minutes to downtown Montreal. 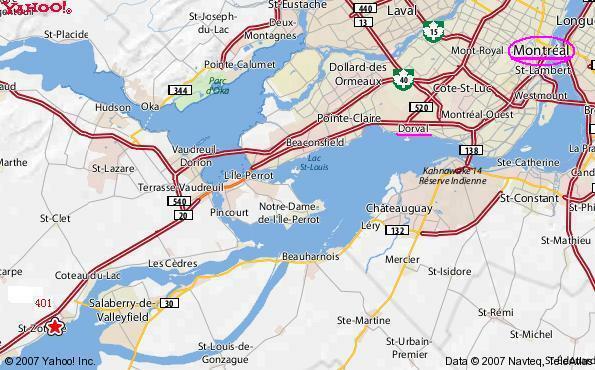 From Toronto: Take Highway 401 East, in Quebec will become Highway 20 Eastbound. Exit 9 for St-Zotique. Turn left,comes to the lakeside, turn left again on autoroute 338 ( rue Principale) east, about 2 kilometers,the motel is on your right. From Montréal :Highway 40 Westbound, 540 South and 20 West. Exit 12 for Coteau-Landing. 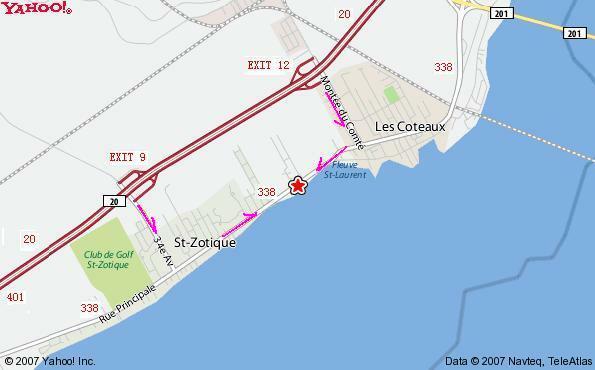 Turn right,comes to the lakeside, turn right again on autoroute 338 ( rue Principale) west, about 500 meters,the motel is on your left. From Ottawa : Highway 417 Eastbound, in Quebec will become Highway 40 Eastbound, then Highway 540 also Southbound to Highway 20 West. Exit 12 for Coteau-Landing. Turn right,comes to the lakeside, turn right again on autoroute 338 ( rue Principale) west, about 1 kilometer,the motel is on your left.